WHAT is a House Concert? 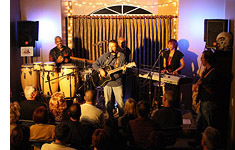 A house concert is a chance to experience music in a warm and intimate environment. It's when someone opens up their home and invites you into their living room to share in a performance by one of their favorite musicians. 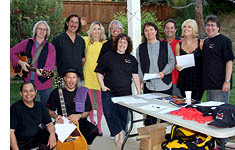 It's a chance to meet the performers and get them to sign their CD. 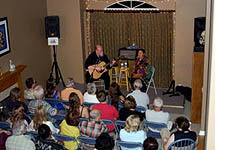 A house concert is also a great social evening of friends and neighbors. WHY would anyone do this? We open up our home to our friends and neighbors because we want to share great music with them. In the area where we live -- like most of the world today -- there are too few venues where people can go to experience great music in a close and friendly environment. Great music makes us happy and we want to share that with others around us. These events allow us to give exposure to some incredible musicians whose talents we truly believe in and wish to help promote.